[RECAP] The disciples have gone and they have seen. They have brought the five loaves and the two fish to Him and they have asked simply the most logical, rational question they could ever ask. "But what is this among so many?" (cf. John 6:9). Yet Jesus directed them to break the group into fifties and have them sit down. And you know the most amazing thing? Those disciples did what He told them to do. Isn't that stunning? You see, the way to carry out the first reality is simply to do what Jesus tells us to do. We can count 50. We can break the group into fifties. Now there's an inherent promise in what we're doing. But we can do that! At that point in time, they were radically, desperately dependent on Him. At that point in time, they were just ready to do what He told them to do, and so they acted. And that's a great place to be. In your business, in your ministry, in your family, in your heart. When you get there, you're in a magnificent place. So look what happened. Mark 6:41. "Taking the five loaves and the two fish and looking up to heaven, He gave thanks and broke the loaves…" Now I hope you understand what was going on right there. I hope you understand that Jesus was praying 'thank You Father for what You have given to us.' It was a prayer of thanksgiving, yes, but innate in thanksgiving, inherent in this prayer of thanksgiving was a declaration of dependence. "Thank You Father, I am dependent on You. Here are the resources You gave Me. I have five loaves, I have two fish, they are from You. Work Your power through Me." Very critical for us to understand that Jesus lived the same way He wants us to live. He lived dependently on His Father. And He wants us to live in a dependent way on Him. Jesus is teaching us how to be effective. Jesus is teaching us how to lead well. Jesus is teaching us how to make the difference. You see, skills are essential, but not sufficient. Skills without power are like a power saw without a plug. We may have the blades that are needed to do the cutting but if we don't have a place to plug in and get the power, we're inert. That's the point! That's the point! 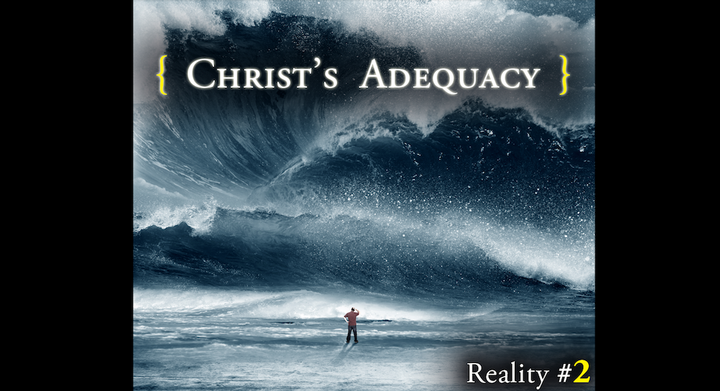 He overcomes our inadequacy with His adequacy. This is the beauty of following Him and of being follower-leaders for Jesus. See, we follow Him, we learn to live the way He lived, we live the same way. Then, having learned that, we become leaders. My friend, when the Lord brings you to the wall of inadequacy and when you're ready to settle down and quit and have your nice, sweet Sunday smile and have your nice, ordinary ministry and have your nice sweet church, you're missing the point. Oh, you're safe. You're not at risk. But what difference are you making? When Jesus prayed and He received the bread and then He prayed, then you know what He did. He broke that bread and broke that bread and where did He, what did He do with it? Did He walk among the five thousand distributing it? Absolutely not! He took it from His hand to their hands. See, that's the way reality is. We bring what resources we have, never enough, we bring them to Him. We put them in His hands and then He says, 'Well, wait a minute now. Now stay here. Don't go yet. Hold out your hand.' And He puts in our hands a part of the five loaves and two fish. And He says 'now go and do what I told you to do…. "You give them something to eat!" (cf Mk. 6:37). And so the men went and went and went and went. Doesn’t this challenge you? Don't you find this exciting? Doesn't this stir you? That the Lord could use you to meet the needs of people in ways you never dreamt of before? Don't run away from His opportunities. Don't' say to Him, "I can't do this, I not good." Oh, you should say that to Him, but that is not a reason why you should not step forward, why you should not bring what you have and say, "alright Lord, whatever You have, I'll take it from You. I give you what I have, now give me back." When I was very young, just finishing high school, I had not been a good student in high school at all. There were a lot of things that I struggled with. I was just a very poor student. Mediocre, middle…not even in the middle of my class when I graduated. I was way down. Then I went to college and I still remember the night that I knelt down beside my bed, I was afraid. And I said, "Lord, I can't do this." I said, "Lord, I'll give you my best, but only if You help me. I cannot do it without You!" And you know what I did all they way through college and then on to seminary and then on to additional study? Do you know what I did? I brought what I had and gave it to Him and He gave me what He had for me. You must do what you cannot do with what you do not have because He will do what He can do with what little you have.